One of my clearest and happiest memories of childhood takes place just before my family disintegrated. As I’ve mentioned before, exposure to classical music was an integral part of my upbringing. When I was five years old the family lived in Toronto while my mother was going to opera school. Because she also worked in a hospital lab by night we rarely saw her. Dad was there for my brother and I, but I have no memories of him being that devoted. Naturally, because of mom’s career trajectory we listened to a lot of opera. And, I fell in love with it. Cavalleria Rusticana (Mascagni) was among my favourites. (Yes, imagine that as a five-year-old’s memory). I can even remember the record cover and studying the intricate details of the graphic design. However, my strongest memory is powered by the profoundly beautiful dramatic opera, La Traviata (Verdi). Mom had a record of highlights which I remember we listened to quite often. My favourite soprano aria was, and still is, Sempre Libera ~ Violetta’s big vocal moment. When I hear this incredible aria, I’m transported back to a Sunday afternoon (might have been Saturday) in our apartment living room when my parents were having friends from the opera school over for a visit. Though I don’t recall exactly how the moment unfolded or even if I sang the whole thing (that would be asking too much), I do remember Sempre Libera playing on the stereo and me at centre stage in the middle of the room, commanding attention and singing my heart out. I believe I even did a little dance toward the end. My own Violetta unleashed. Of course, everyone clapped and for that moment ~ a rare moment ~ I felt special in the eyes of both my parents at the same time. 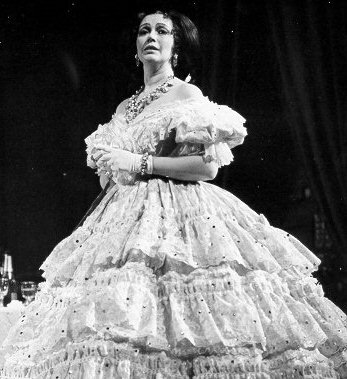 Lois McDonall, my mother, as Violetta in Guiseppe Verdi’s “La Traviata.” English National Opera production. As the years went by and my mother’s career blossomed, she performed the role of Violetta in London and beyond. This, naturally, only increased my love for, and connection with, this opera . The last time I saw/heard La Traviata “live” was in Prague in 2008. It was a spur-of-the-moment decision to go and a wonderful production that only added to my special memories. I live for these kinds of memories. You have a wonderful heritage. I’m beginning to understand where your multiple lines of creativity, energy, and even the ups and downs were seeded. What a fertile field you were given to work with. Like most fields, each spring the rocks come to the surface and need to be harvested. With careful management time leaves fewer to stumble over. You have some great strengths and talent to work with.